quick change artist of any yard program! 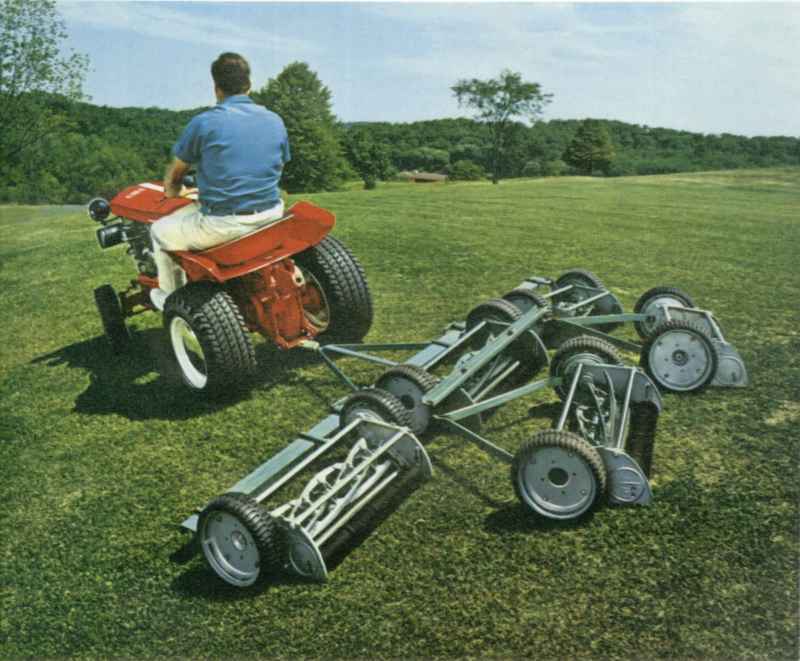 5-Gang Mower (Mfg. No. 990275) With their giant 98" swath, these five units really gang up on big grass cutting jobs, covering nearly 4-1/2 acres per hour. Two outside units detach quickly for mowing smaller areas. Cutting heights adjust from 1" to 2-1/8". 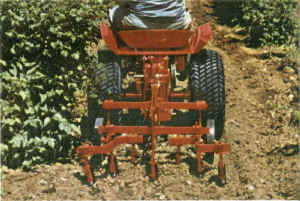 Unique hitch allows all five units to follow ground contours. Flex-tread tires (3:50 x 11:25) take it easy on turf. 42" Rotary Mower (Mfg. No. 990285) Mows at a 2-acre-per-hour clip. Has patented FREE FLOATING feature - mower is mounted on front axle so it follows front wheels over contours, never scalps. 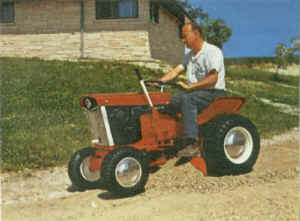 Hydrolift lowers and raises mower. Extra deep housing and large discharge chute prevent clogging. Three specialty designed cutting blades have added tip life. Cutting height adjustable 1-5/8" to 3-1/8." (Requires No. 990349 Power Take-Off. Leaf Mulcher No. 990284 optional. 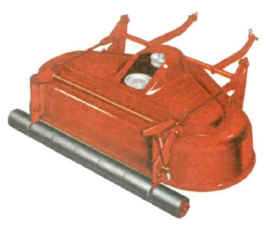 32" Rotary Mower (Mfg. No. 990207) Never scalps, thanks to patented FREE FLOATING feature -- tractor's front wheels tilt the mower over uneven ground. 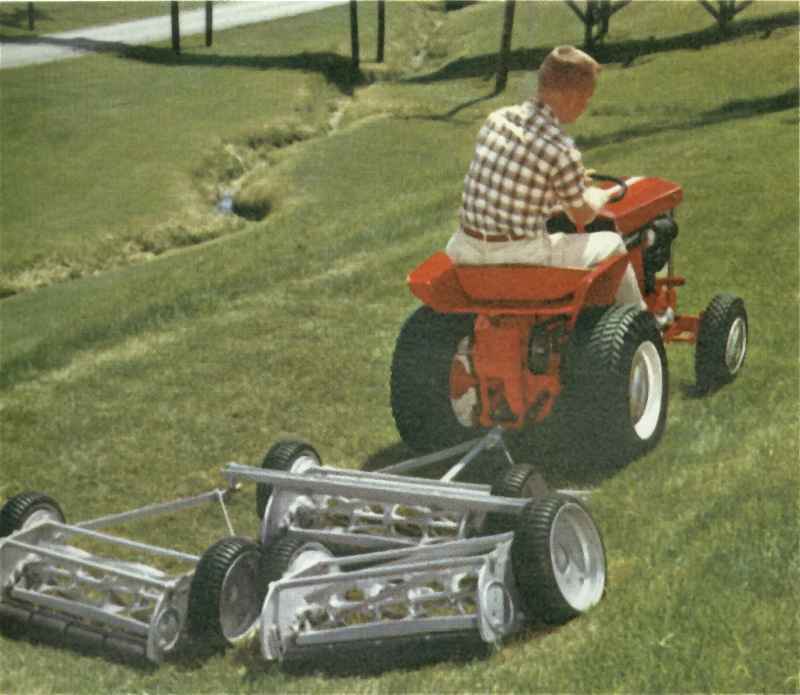 Mows 1-3/8 acres per hour with 3 high-carbon hardened steel blades and heavy-walled steel housing for longer life. (Requires No. 990340 Power Take-off.) Leaf Mulcher No. 990173 optional. Simplicity™s easy hitching saves you time, temper and trouble. You can disappear around the corner of the house and reappear with a different attachment so quickly the neighbors will think you™re a quick change artist. But the artist is really the 10 hp Landlord, and the engineers who designed it. Hard as other brands of lawn and garden power equipment try to come close to Simplicity performance, there™s always one hitch that keeps them from matching its quality and conven ience ” and that™s Fast Hitching! None offers faster hitching of implements than Simplicity. It takes less than a minute to change from one implement to another. So, all that time you™d ordinarily spend changing attach ments or looking for tools can be used to hurry through your yard work. Compare this fast hitching feature with other brands. It™s just one more convenience item from Simplicity that leaves you more time for leisure living. 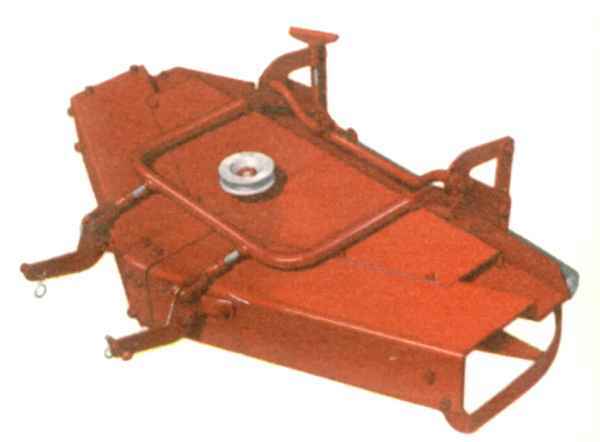 3-Gang Mower (Mfg. No. 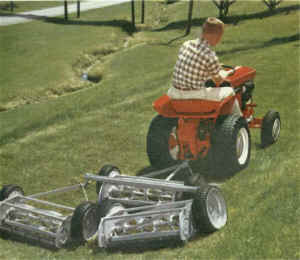 990273) Three 22 ground driven mowers cut a smooth swath 5ft wide, finish 2-3/4 acres an hour. Heavy duty construction takes daily pounding in stride. Flex-tread tires are easy on turf. 10" Moldboard Plow (Mfg. No. 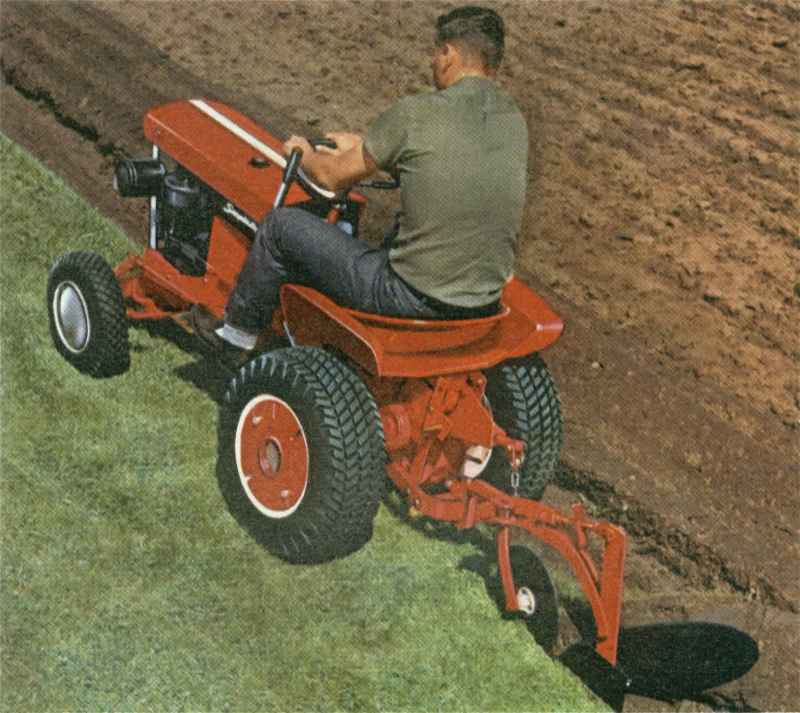 990204) Rolling coulter cuts trash, lets you slice a neat, clean furrow. 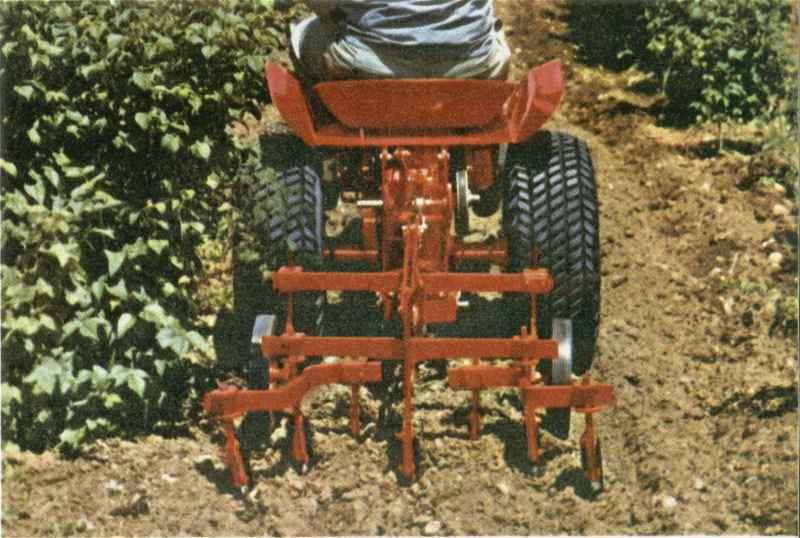 Handy depth regulator gives precise furrow control. (Requires No. 990203 Hitch Adaptor.) Four No. 990046 wheel weights and 990315 tire chains recommended for sure-footed traction over soil and during heavy plowing. Original, damaged catalog courtesy of Steve Redfern with some pictures courtesy of Chris Geise. Entire catalog in great condition, courtesy of Wally Becker.